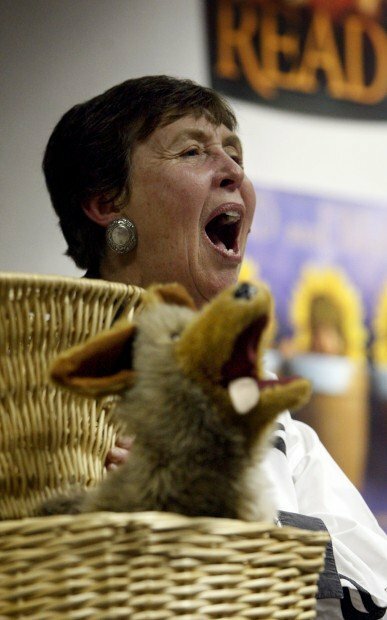 Storyteller Glenda Bonin and her puppet, Clyde the coyote, get in some howling with youngsters during a storytelling at the Dusenberry library. Glenda Bonin was showing off her kids in this pose from 1969. From left are John, Marc, Steven, Catherine and Paul. They had some inkling of her performance skills even then. Glenda Bonin used to perform as a clown in New Jersey. She began at her daughter's birthday party. It's restless crowd here at the Dusenberry-River Library. A baby squalls, toddlers wander, and more than one grandfather looks a little bored. And then Glenda Bonin opens her mouth. Out of it spill fanciful tales of beautiful beetles and slumbering bears, shape-shifting coats and turtles who talk too much. Her audience at that library on a recent Monday afternoon - save perhaps for that baby - was transfixed by Bonin as she complied with that oldest of wishes: Tell me a story. For more than a decade, Bonin has been doing just that: spinning her stories everywhere from Wyoming to Tennessee, Washington to Pennsylvania. "I have an RV that I park at a neighbor's. It's my office," says Bonin, who will roll that RV back and forth to Washington state again this summer. "I have two full weeks of bookings," adds Bonin. She'll also call up folks in towns along the way, inquiring if they, too, would like a performance or two. "It's very tenuous," says Bonin, who is a member of the National Storytellers Network and the Puppeteers of America. "I don't make a lot of money, but I'm happy. It pays my bills." Who would have thought such a natural entertainer would emerge from a rather horrendous birthday party? "My daughter wanted a pony for her fifth birthday party," says Bonin, who is sixtyish and a mother of five. "I couldn't afford it." Instead, she borrowed a neighbor's clown costume, bought a red nose and slapped on the greasepaint. "It was a disaster. I had no foundation in clowning. After the party, I sat on the stairs and cried and cried." Amazingly, she got calls from other neighbors, asking her to perform at their kids' parties. And thus Whispers the Clown was born - in time aided by magic tricks Bonin learned from fellow magicians in Matawan, N.J., where the family was living. "I was going to be Lady Macbeth, and instead I was Whispers the Clown," says Bonin, who as a teenager trained for more than two years at the Portland Civic Theatre, in Portland, Ore.
One way or the other, the performer was going to win out. Born in Wyoming, Bonin was the daughter of Clair Musser, a singing cowboy with the Powder River Ramblers. "They did backup for a lot of singers, including Willie Nelson," says Bonin. But her parents divorced when she was 8, and she grew up in Portland. "I was a problem child, but then I got interested in drama in high school," says Bonin. "After high school, I wanted to be an actress." Instead, at age 19 she married David Bonin, an electrical engineer whose job with the U.S. government would take the family everywhere from New Jersey to Germany to Tucson, where the couple divorced in 1978. It was back in New Jersey where Bonin first tackled storytelling as a volunteer with the Matawan Public Library. There, she read books to the children. "My first reading was horrible," says Bonin, who also did finger plays - think "Itsy Bitsy Spider." Then came Whispers the Clown, which Bonin trotted out from 1968 to 1980. During the latter years, she taught classes on clowning here in Tucson to pupils ages 6 to 86 and also helped form Calamity Clowns. With a divorce looming, she went to work for KGUN-TV in 1977 as a programming secretary, but she still clowned around on the side. But in 1980 - the same year she went to work as a media coordinator for the Tucson Museum of Art - she put away the red nose for good. "My routines became so routine I canned my show," says Bonin. "I had new audiences, and I could do the same shows over and over, but I lost my enthusiasm." Instead, she concentrated on a career in marketing and communication, briefly in Phoenix but mainly in Tucson. By the mid-'90s, her father was dying in Portland, and she had also lost her job in a downsizing. "When that happened, I realized I was happiest when performing and telling stories." And so she set about reinventing herself once again, this time as a storyteller. In the late '90s, she earned graduate credits at East Tennessee State University through its Storytelling Institutes program. Besides presentations, Bonin gives workshops on the fine art of storytelling to parents and teachers alike. "There's been a wonderful resurgence in storytelling," she says. "There is a need for people to connect." Right now, Bonin has more than 100 stories in her head - often folk tales attached to a moral. "I play with it, rewrite it, add characterizations," says Bonin, who works about 10 hours on a story before it is "firm." Many of her stories are on CDs, including "Dusty Vail Tales," recollections that cowgirl Dusty Vail shared with Bonin - stories that Bonin has told since 2007 at the annual roundup celebration at the Empire Ranch, the historic spread located 50 miles southeast of Tucson. She's also researching the life of her grandmother, Vera Martin, with the idea of taking on her grandmother's persona in Chautauqua form, which mimics the popular traveling shows of the early 20th century. "She gave up my dad at age 15 and later married a man who owned the second-biggest gold mine in North America." We can't wait to hear that one. To find out more about Glenda Bonin or to schedule a presentation, go to www.storyworksgroup.com or call 1-888-252-3033. Fees on a sliding scale start at about $200. Bonin's stories also can be heard on her Web site. While working at KGUN-TV in the late 1970s, Glenda Bonin performed as a clown with the Ringling Bros. and Barnum & Bailey circus when it came to Tucson. Bonnie Henry's column appears Sundays and Mondays. Reach her at 573-4179 or at bhenry@azstarnet.com, or write to P.O. Box 26807, Tucson, AZ 85726.